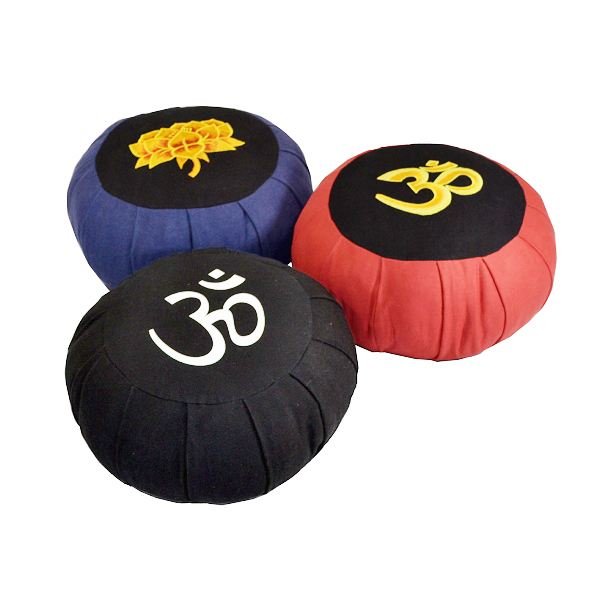 Our Round Embroidered Cotton Meditation Zafu Cushion gives you designer style without paying custom prices. Choose the blooming lotus flower or the inspiring ohm symbol, beautifully embroidered on the top center of the pillow. Colors include a vibrant orange or a more subtle black, green, red or purple. The 100% twill cotton cover is very durable, but when you need to wash it, look for a hidden zipper for removal. Our cotton Zafu meditation pillow is filled with a generous three inches of natural cotton stuffing. The inner batting, which is securely enclosed in a natural cotton casing, is packed densely enough to provide solid support, but soft enough for comfort. The round shape is traditional, but this embroidered design is contemporary and will add style to your meditation room or corner. We also think this round embroidered Zafu is the perfect designer-style gift for that special someone on your list. I am really enjoying this zafu! The yellow lotus design is embroidered on and really stands out beautifully. It is very firm and comfortable, which is great and I use it for meditations. Very nice and what I was looking for in a mediation cushion. good bye bolster! Great price on a very well made zafu. I spent few days comparing different ones from various websites and decided this one is the best in terms of style and price. I ordered the blue/black one with the yellow lotus. It looks and feels great. I do wish it was just a little bigger but I'm still happy with my purchase. I love my zafu! It's quality made and firmly stuffed, which helps relieve circulation problems when I'm sitting. I use it at home and even carry it to group meditation. Highly recommended. This is exactly what I needed at a fraction of the price! I'm so glad I found Yoga Accessories. I ordered the purple Om color and its firm, supports me and keeps me comfortable while I'm meditating or just sitting in front of my meditation table...beautiful! Makes me want to meditate more, which is what I just have to do for my stress levels. Thank you, thank you, YogaAccessories! Yes, this IS what you're looking for. I wanted a meditation cushion, I looked around a little bit and decided to take a chance. Would this be too soft? Too hard? Too big? This is perfect, this is exactly what you are looking for. Saw this same cushion in a yoga store in NYC for over $100 and quite frankly the one I bought on your website felt like it was nicer quality. Not only is it a perfect meditation cushion, it doubles as a perfect throw on our bed. Thank you! I ordered the 3 color om on yellow-which is more like an orange and they are stunning! They we out of stock with them, sent me and email, and then they arrived shortly after! I highly recommend them!! I bought the purple one for myself and one of the black ones for my husband. They are quite comfortable and makes the meditation practice much more enjoyable.